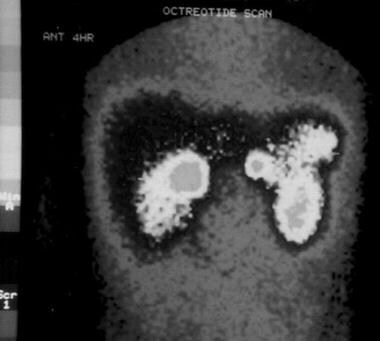 Somatostatin receptor scintigraphy in a young patient with Zollinger-Ellison syndrome. Besides physiologic uptake in the kidneys and the spleen, 2 pathologic hot spots are present, one in the area of the duodenum and another next to the pancreas. Childhood gastrinomas account for about 2% of all Zollinger-Ellison syndrome cases in the United States. The overall incidence of gastrinomas occurring sporadically or in association with multiple endocrine neoplasia type 1 (MEN-1) is 0.1-3 per million; the prevalence of MEN-1 is 0.2-2 cases per 100,000 population. MEN-1 is diagnosed in 30-38% of patients with gastrinomas, whereas 20-61% of patients diagnosed with MEN-1 are found to have gastrinomas associated with Zollinger-Ellison syndrome. Until 1992, 60 cases of Zollinger-Ellison syndrome in children had been reported worldwide. The youngest patient reported with Zollinger-Ellison syndrome was a boy aged 7 years. Gastrinomas have been found in patients aged 90 years and younger, with the most common age at diagnosis being 30-50 years. This syndrome was originally described by Zollinger and Ellison in 1955. In 1960, Cawkwell described the first childhood case of Zollinger-Ellison syndrome in The New Zealand Medical Journal. See also Pediatric Multiple Endocrine Neoplasia, Pediatric VIPoma, Gastrinoma, Zollinger-Ellison Syndrome, Wermer Syndrome (MEN Type 1), and Peptic Ulcer Disease. Gastrinomas may be sporadic or may be associated with multiple endocrine neoplasia type 1 (MEN-1). Data suggest that the gene for MEN-1, called MENIN, is also involved in the pathogenesis of at least one third of sporadic neuroendocrine tumors (NETs), including gastrinomas. Therefore, all patients who are under evaluation for Zollinger-Ellison syndrome (ZES) should undergo genetic testing for MEN-1. MEN-1 is known to cause multiple tumors within the pancreas, pituitary, parathyroid, and adrenal glands through an autosomal dominant pattern of inheritance. Patients with MEN-1 may also have an increased risk of skin lesions and carcinoid and smooth muscle tumors. MEN-1 is due to mutations in the tumor suppressor gene MEN1, located on chromosome 11q13. MEN1 encodes a transcriptional regulator protein, menin. Patients with MEN-1 have one germline mutation and one somatic mutation that lead to inactivation of menin. Gastrinomas are the second most common neuroendocrine tumors in the overall population, after insulinomas and before vasoactive intestinal polypeptide tumors (VIPomas) and glucagonomas. Gastrinomas may secrete not only high levels of gastrin, causing peptic ulcer disease (PUD) but also may secrete other hormones such as adrenocorticotropic hormone (ACTH), vasoactive intestinal polypeptide (VIP), and glucagon. Gastrinomas may also produce various peptides such as insulin, pancreatic polypeptide, glucagon, chromogranin A, neuron-specific enolase, and the alpha and beta subunits of human chorionic gonadotropin (HCG). Before the introduction of acid-suppressing drugs, including histamine H2-receptor antagonists and, more recently, proton pump inhibitors (PPIs), Zollinger-Ellison syndrome (ZES) carried high mortality rates. Because safe control of gastric acid hypersecretion can be achieved with PPIs in virtually all patients, mortality and morbidity are now attributed to advanced disease with metastases to liver and bones. Due to small numbers, it is not clear whether gastrinoma tumor growth in children is less aggressive than in adults, as previously thought. In a study from the National Institutes of Health (NIH) involving 151 patients with Zollinger-Ellison syndrome, the 10-year survival rate was 94% in the overall Zollinger-Ellison syndrome population. The survival rate at 10 years was slightly lower (89%) when Zollinger-Ellison syndrome was associated with multiple endocrine neoplasia type 1 (MEN-1). In the latter condition, a high prevalence of gastric carcinoids has been described; these carcinoids can be malignant in 10–30% of cases; thus, they require active surveillance to prevent increased mortality. Approximately 60% of gastrinomas are benign at the time of diagnosis, without metastases. Because of the small size of gastrinomas, cure (disease free for at least 5 y) is achieved in only 20-40% of cases. With the introduction of PPIs that are effective in almost all patients, acid-related complications are now reduced to a minimum. Complications of peptic ulcer disease (PUD) before the diagnosis include perforation, bleeding, and esophagitis. A stricture of the gastroesophageal junction may develop. Massaro SA, Emre SH. Metastatic Gastrinoma in a Pediatric Patient With Zollinger-Ellison Syndrome. J Pediatr Hematol Oncol. 2013 Feb 15. [Medline]. Gibril F, Schumann M, Pace A, Jensen RT. Multiple endocrine neoplasia type 1 and Zollinger-Ellison syndrome: a prospective study of 107 cases and comparison with 1009 cases from the literature. Medicine (Baltimore). 2004 Jan. 83(1):43-83. [Medline]. Imamura M, Komoto I, Ota S. Changing treatment strategy for gastrinoma in patients with Zollinger-Ellison syndrome. World J Surg. 2006 Jan. 30(1):1-11. [Medline]. Zollinger RM, Ellison EH. Primary peptic ulcerations of the jejunum associated with islet cell tumors of the pancreas. Ann Surg. 1955 Oct. 142(4):709-23; discussion, 724-8. [Medline]. [Full Text]. Passaro E, Howard TJ, Sawicki MP, et al. The origin of sporadic gastrinomas within the gastrinoma triangle: a theory. Arch Surg. 1998 Jan. 133(1):13-6; discussion 17. [Medline]. Debelenko LV, Emmert-Buck MR, Zhuang Z, et al. The multiple endocrine neoplasia type I gene locus is involved in the pathogenesis of type II gastric carcinoids. Gastroenterology. 1997 Sep. 113(3):773-81. [Medline]. Kulke MH, Mayer RJ. Carcinoid tumors. N Engl J Med. 1999 Mar 18. 340(11):858-68. [Medline]. Evans JT, Nickles S, Hoffman BJ. Primary hepatic gastrinoma: an unusual case of zollinger-ellison syndrome. Gastroenterol Hepatol (N Y). 2010 Jan. 6(1):53-6. [Medline]. [Full Text]. Riff BP, Leiman DA, Bennett B, Fraker DL, Metz DC. Weight Gain in Zollinger-Ellison Syndrome After Acid Suppression. Pancreas. 2015 Jul 8. [Medline]. Norton JA, Fraker DL, Alexander HR, et al. Surgery to cure the Zollinger-Ellison syndrome. N Engl J Med. 1999 Aug 26. 341(9):635-44. [Medline]. Nord KS, Joshi V, Hanna M, et al. Zollinger-Ellison syndrome associated with a renal gastrinoma in a child. J Pediatr Gastroenterol Nutr. 1986 Nov-Dec. 5(6):980-6. [Medline]. Morrow EH, Norton JA. Surgical management of Zollinger-Ellison syndrome; state of the art. Surg Clin North Am. 2009 Oct. 89(5):1091-103. [Medline]. Eire PF, Rodriguez Pereira C, Barca Rodriguez P, Varela Cives R. Uncommon case of gastrinoma in a child. Eur J Pediatr Surg. 1996 Jun. 6(3):173-4. [Medline]. Ito T, Jensen RT. Primary hepatic gastrinoma: an unusual case of zollinger-ellison syndrome. Gastroenterol Hepatol (N Y). 2010 Jan. 6(1):57-9. [Medline]. [Full Text]. Heikenen JB, Pohl JF, Werlin SL. Octreotide in pediatric patients. J Pediatr Gastroenterol Nutr. 2002 Nov. 35(5):600-9. [Medline]. Kim HU. Diagnostic and Treatment Approaches for Refractory Peptic Ulcers. Clin Endosc. 2015 Jul. 48 (4):285-90. [Medline]. Berna MJ, Hoffmann KM, Serrano J, Gibril F, Jensen RT. Serum gastrin in Zollinger-Ellison syndrome: I. Prospective study of fasting serum gastrin in 309 patients from the National Institutes of Health and comparison with 2229 cases from the literature. Medicine (Baltimore). 2006 Nov. 85(6):295-330. [Medline]. Berna MJ, Hoffmann KM, Long SH, Serrano J, Gibril F, Jensen RT. Serum gastrin in Zollinger-Ellison syndrome: II. Prospective study of gastrin provocative testing in 293 patients from the National Institutes of Health and comparison with 537 cases from the literature. evaluation of diagnostic criteria, proposal of new criteria, and correlations with clinical and tumoral features. Medicine (Baltimore). 2006 Nov. 85(6):331-64. [Medline]. Proye C, Malvaux P, Pattou F, et al. Noninvasive imaging of insulinomas and gastrinomas with endoscopic ultrasonography and somatostatin receptor scintigraphy. Surgery. 1998 Dec. 124(6):1134-43; discussion 1143-4. [Medline]. Norton JA, Melcher ML, Gibril F, Jensen RT. Gastric carcinoid tumors in multiple endocrine neoplasia-1 patients with Zollinger-Ellison syndrome can be symptomatic, demonstrate aggressive growth, and require surgical treatment. Surgery. 2004 Dec. 136(6):1267-74. [Medline]. Corleto VD, Annibale B, Gibril F, et al. Does the widespread use of proton pump inhibitors mask, complicate and/or delay the diagnosis of Zollinger-Ellison syndrome?. Aliment Pharmacol Ther. 2001 Oct. 15(10):1555-61. [Medline]. Jensen RT. Gastrinomas: Advances in Diagnosis and Management. Neuroendocrinology. 2004. 80 Suppl 1:23-27. [Medline]. Kwekkeboom DJ, de Herder WW, van Eijck CH, et al. Peptide receptor radionuclide therapy in patients with gastroenteropancreatic neuroendocrine tumors. Semin Nucl Med. 2010 Mar. 40(2):78-88. [Medline]. Citak EC, Taskinlar H, Arpaci RB, Apaydin FD, Gunay EC, Tanriverdi H, et al. Primary lymph node gastrinoma: a rare cause of abdominal pain in childhood. J Pediatr Hematol Oncol. 2013 Jul. 35(5):394-8. [Medline]. Mozell EJ, Cramer AJ, O'Dorisio TM, Woltering EA. Long-term efficacy of octreotide in the treatment of Zollinger-Ellison syndrome. Arch Surg. 1992 Sep. 127(9):1019-24; discussion 1024-6. [Medline]. Somatostatin receptor scintigraphy in a young patient with Zollinger-Ellison syndrome whose gastrinomas were resected. The LEFT (big) tumor was a periduodenal lymph node gastrinoma; the RIGHT tumor was a pancreatic gastrinoma. Despite negative findings on the scan, the patient remained hypergastrinemic, probably because of microscopic disease that escaped diagnostic imaging and surgical exploration.